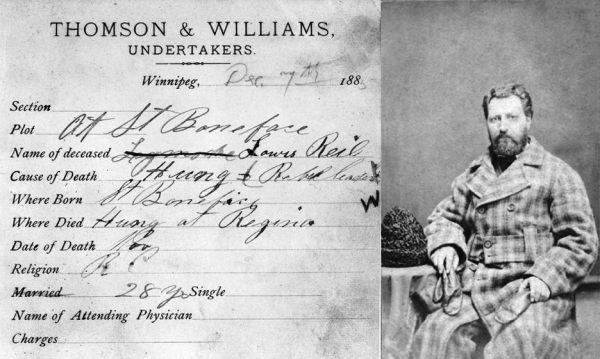 Did Louis Riel hide in my ancestor’s basement? Family lore says that my ancestor Joseph Arial had many meetings with Louis Riel in the basement of a hotel he owned. The story might be about a hotel in St. Boniface that may have served as a hide-away for the Métis hero and later burned to the ground or it may be referring to a hotel owned by his son Joseph Gabriel, who ran his own hotel in Gleichan* (near Cluny), Alberta. How does a genealogist go about proving such a story? The family legend might refer only to my great great great grandfather or his son, or it may combine the exploits of both. My first challenge was figuring out the timing. Louis Riel was born in the Red River Valley in 1844 and was hanged for treason on November 16, 1885. Then I began searching through the names and dates of my ancestors’ lives. Joseph Arial was the first of my ancestors who left Quebec. He was born in 1812 in St. Roch and died on November 4, 1880 in St. Boniface, Manitoba, where he is buried. His wife was Julie Belleau dit LaRose who was born the year before he was. The two were married in St. Roch on September 4, 1832. St. Boniface is on the south side of the Red River, so the location is correct, although he would have been much older than Riel. His son, Joseph Gabriel was married to Marie Sophie Bernard in St. Boniface, Manitoba on August 8, 1887. Their hotel would be too late to have anything to do with Riel. Joseph’s wife is important to my story, however, because her mother was born in 1838 in St. Anne-des-Chênes (Oak Point), just down the river from where Riel would be born six years later. Her mother, Sophie Henault Canada was also born in the Red River Valley, so there were roots that went back years. The possibility that Sophie’s parents, Charles-Henault-Canada and Marie Gris, knew Louis Riel’s parents, Julie Lagimodières and Jean-Louis Riel, who were married in the chapel of St. Boniface Cathedral on January 21, 1844 were high. My next step will be to verify the guests at the marriages of Joseph Gabriel and Marie Sophie and the marriage of Julie Lagimodières and Jean-Louis Riel, but in the meantime, perhaps what happened after Riel’s death will tell us more. My first impression of Gleichen was when we arrived by way of Calgary from the Blood Reserve. We stayed in the Palace Hotel, owned by a French Canadian named Mr. Gabriel Arial, and I think he built it. Some of the Old Timers seem to think it was originally build of logs, but I had seen parts of it torn down and repaired here and there with no logs under the sheeting, but the rough boards were hand-sawn with the old, long ripsaw, and iron nails were used. The style was what you might call early Western, and no luxuries were provided. The rooms contained a bed, chair, washstand and plain dresser, a big jug full of cold water and a smaller jug, for drinking. If you needed more water you took your jug downstairs and outside, to the well. A kerosene lamp provided light. The Arials welcomed us, and were very hospitable. So were the cockroaches and bed bugs, but that was the usual thing in any dwelling in those days. There were no insect repellents, except kerosene and pyrethrum powder and these failed to attain victory. A a standoff was the best to be hoped for, as the walls were hollow and the plaster cracked so the enemy could retreat and fight another night. I went to school later with the Arial boys and girls. The hotel was later sold to Brosseau Brothers, and the Arials moved to Edmonton. Is this Gabriel my grandfather? I don’t know for sure yet, but I think so. My grandfather was called Gabe after his father and he grew up in Edmonton. My grandmother also moved to Cluny as a child and that’s where they met. This Gabriel Arial may also have been a cousin though, so I still have much more verification to do. All the facts about Louis Riel and his life in this story come from Maggie Siggins’ book “Riel A Life of Revolution” Harper Collins, Toronto, 1994. For this part, I relied on the handwritten notes of Mary Alice Kite and my grandmother, Ann Marguerite Arial. My grandmother learned how to do genealogy from Mary Alice and she knew my great grandparents personally. She would have confirmed their parents’ and grandparents’ names with them. She also collected photos of the family, which I now have. Few of the people can be easily identified now. The Prairie Hub, by John Julius Martin, Rosebud, Alberta, The Strathmore Standard, 1967, p. 160. *An earlier version of this story spelled Gleichen incorrectly. I have old photos as well maybe we could get in touch!